The Oticon Medical Streamer is part of the ConnectLine range. It is the key to the ConnectLine, working as the connectivity interface for the Oticon Medical implantable hearing solutions eg Ponto - currently compatible with Ponto Plus, Ponto Plus Power and Ponto 3. Note - this Streamer is NOT compatible with hearing aids. It wirelessly connects the Ponto Plus to audio sources for communication, entertainment and information purposes, such as a mobile phone, landline phone, TV, music player, PC, etc. The Oticon Medical Streamer connects your Ponto wirelessly to different audio sources and makes them work like wireless headphones. The Oticon Medical Streamer transmits the sound directly into both Ponto instruments and thereby improves the audio experience by giving excellent sound clarity. 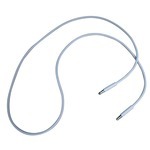 This latest generation of Oticon Medical Streamer connects to Android devices plus iPhone®, iPad® and iPod touch® via the free Oticon ConnectLine App! The Oticon Medical Streamer is the core in the ConnectLine system where easy, convenient daily use is in focus. It features simplified buttons for the 3 core connectivity applications: ConnectLine phone, TV and microphone up to 8 hours of streaming for a full day's use. directly to the instruments. The benefit is a 10 kHz undistorted, crystal clear audio signal. In the ConnectLine system, Oticon Medical Streamer identifies all other ConnectLine devices (purchased separately, see Associated Items on Right) connected and ensures that the desired audio source are heard when needed. The Ponto Plus needs no operation by the user but will automatically switch to the correct program dedicated the selected audio source. When a set of hearing instruments is linked to Oticon Medical Streamer, audio is transmitted directly and securely to one or both Ponto Plus. The Ponto Plus resembles miniature wireless headphones, custom tailored to the user’s hearing loss. The AutoConnect feature makes sure that other ConnectLine devices and mobile phones are always connected and ready for use. Just turn on the ‘Connect’ function and all ConnectLine applications are easily controlled by pressing one button on Oticon Medical Streamer. Controlled by AutoPriority, 4 wireless devices can stay connected and be used seamlessly. When not used for audio streaming, Oticon Medical Streamer also functions as a remote control for volume control and program shift. The Oticon Medical Streamer has built-in Bluetooth technology for wireless connectivity to ConnectLine devices and supports all relevant Bluetooth profiles. Bluetooth is a commonly used global standard for mobile phones and offers a transmission range of up to 30 feet. With just a few taps, you can set the perfect sound levels for your phone, music player, TV and any other devices you’d like to connect with. Switching between different applications is seamless. Just swipe from one to the other and it’s done. The large volume controls mean you can make adjustments in a second – so you get the sound levels you want, instantly. Supplied with: grey Neck straps (medium and long)*, UK Power adapter for charging, USB PC-charger cord, PC/Audio interface cable kit, Protective silicone skin. * The neckstrap is part of the system, and should always be used for best possible performance. The Oticon Medical Streamer doesn't need to be set up with your Ponto - it is ready to go straight out of the box. Battery total life expectancy 80% capacity left after 720 charge/re-charge cycles. 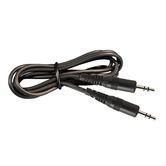 Other connectivity solutions Analogue input (3.5 mm mini-jack), Analogue output (3.5 mm minijack) for PC headset interface (VoIP/Skype), Mobile phone headset (Bluetooth handsfree or headset profile), Streaming/wireless music (Bluetooth A2DP), FM input (Europlug), Telecoil (built-in). Remote control of Ponto Plus Volume, program shift and mute of Ponto Plus microphones. Paring details up to 8 at the same time. Up to five active wireless devices supported at once (2 phones, 1 TV adapter, 1 microphone and 1 A2DP). Only one source can be listened to at once. Dual microphone noise reduction The Ponto Streamer has two microphones. 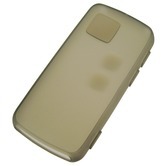 This enables suppression of surrounding noise - in the signal sent to the person the Ponto user is talking to. EarStream range 0.5 meter nominal. Neck loop should be used for best possible performance. Signalling range Incoming call alerts and remote control commands up to 1m. Status indications LEDs on the Streamer. Acoustic signals in Pontos. Currently compatible with Ponto Plus, Ponto Plus Power and Ponto 3. Note: Oticon does not manufacture a car charger. You can however safely use a car charger with a standard USB power specification. The Streamer is specified to 5V DC 200mA. (A standard USB port 5V DC 500mA).